… is a Community of Practice for those who devote at least a portion of their work responsibilities to serve as a trainer or coach within their facilities department – from Building Services to Maintenance, from Safety to Construction, from Transportation to Human Resources and all other facilities-management affiliated areas. 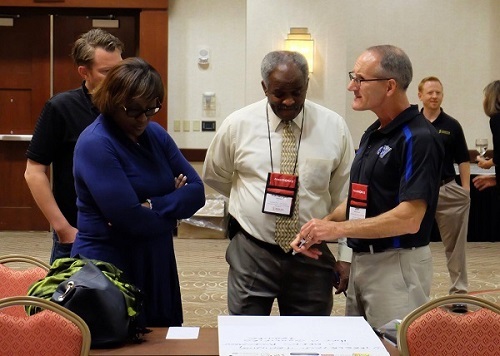 The pinnacle of Facilities Trainers Network is a one-day training and networking session scheduled in conjunction with MAPPA’s Annual Meeting and Conference. The trainers’ session is built on relevant and practical topics that will enhance and expand knowledge and skills that are broad enough to apply to the vast array of settings and employees we each serve. To participate in an annual trainer’s session, visit the MAPPA Annual Conference website and open its registration link. Select registration type “Facilities Trainers Network” and continue your registration for not only this trainer’s event, but the entire conference, its receptions and provided meals, at no extra charge. Benefits linger long past the annual trainers’ session. This Community of Practice is an asset to reach out to others any time during the year, if you have a question about something happening at a different institution or if you are looking for good ideas. We look forward to seeing you! The Facilities Trainer’s Listserv is a service available to anyone interested. It is dedicated to the discussion of any topic of interest to those engaged in providing training for campus facilities staff. Subscription is open to all, but will be most beneficial for trainers or other facilities professionals engaged in training at Universities or Colleges. This list is not intended for commercial use. Advertisements and commercial postings are not appropriate. Before requesting to join this list, please read the MAPPA Listserv Rules & Etiquette.